Stella at one week old. 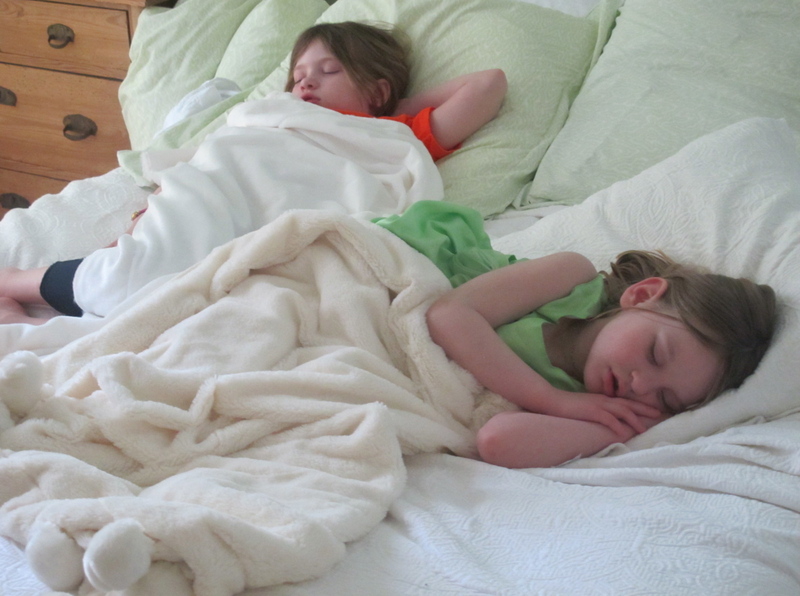 4 p.m. – 7 a.m.: The girls sacked out after a sunrise Easter service. We all know how quickly they grow. For me, the nostalgia unleashes a yearn to have a third. The start is so precious. My life is full; our family feels complete. I witness my friends’ growing bellies, watch my girls happily play with their pint-sized littles, and think I’m not that new mom anymore. Aside from a pang of jealousy – those babies are just so delicious – I’m (mostly) good with that. I’m the mom of school agers. This stage of parenthood is loaded with promise and adventure. It’s equally precious. So, why is it that as I’m rounding the corner to 40 (I turn 39 in July), I’ve been obsessing with: Am I really done having babies? They reminded me that our window was quickly closing and soon time will choose for us. Are we done? became a very real question. I’ve always thought that two was my number. In my early twenties, I nannied a few summers for two boys. At the time, two kiddos felt right … balanced with my two hands. I managed hanging out with two smoothly. Then we had the girls and I knew – two was my number. In due diligence, my husband and I worked through the pros and cons of a third shortly after our youngest (now five) was born. We concluded that a family of four was a good fit for us. Recently, my doctors poured water on the planted seed. The finality. Are we really done having babies? I was 90 percent sure the answer was non, but the now’s-the-time push re-opened the dialogue for us. We reworked through the yeas and nays and it solidified the nah for me. for him. for us. I could say it’s age thing and no one would question, rather they’d likely think, You’re 38 … you have two healthy girls … makes sense. But it’d be a half truth. I’m healthy and not one to feel old. Age isn’t stopping me. The Weight Game: I can’t talk about THE pros and cons of one, two, three, four or more children – only my for and against logic. There is no formula as every family, every person, is different. We all have our own bodies, personalities, support, finances, energy levels, lifestyles, etc. We worked through the weight game early on, but came back for a second round after my doctors broached the topic. The conclusion was the same. The cons outweighed the pros. Bid Adieu to the French Teacher: A big factor for me is work. If I had three kiddos, I would quit teaching. I know I couldn’t handle teaching 112 personalities at school and three at home. It would put me over the edge. I know that in my heart. 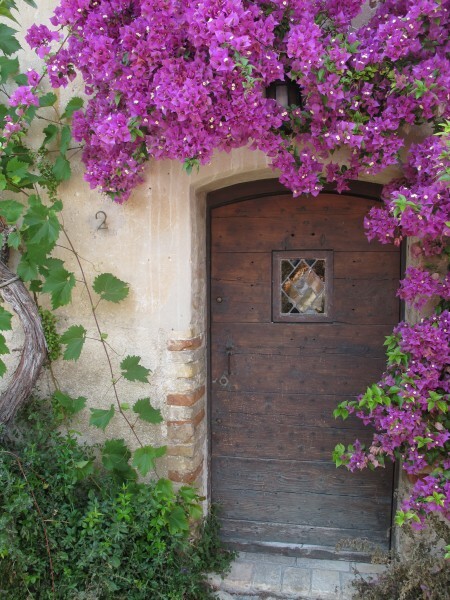 I’m at my threshold. If I quit my career, not only would I lose a piece of my identity, but there goes my salary. With that, we say bye-bye to the many perks and stability a double income provides. The Sweet Spot: The girls are five and eight. We’re enjoying travel, movie nights, sewing projects, pool dives, and just basically running free en famille. There’s so much I’m looking forward to at this stage of parenthood. The girls are gaining independence. Not only are they out of diapers, but they can buckle themselves in the car and shut the car door. They can play in their camper playhouse while I clean a cabinet or make dinner. Veronica can pour her own milk. I am so, so happy in my life right now – it’s the kind of happiness when you look around and know, this is it. I want to guard that with my life. I can work with two. I don’t want to be split in three. I want to jump on the slide with them at the pool without worrying about a baby. If I had a baby in tow, I could watch, but not splash around in the way I want. We are in a sweet spot that lasts but a few years. I think of adding another and then I fast forward four years, when the baby will be in the same sweet spot. At that point, Veronica will be 12 and Stella nine. I don’t want to lose our current sweet spot wrapped up in another child. I want to experience it now, when it’s happening – with our two girls. I easily walk through the first three reasons – they are my brain, my logic. The Final Countdown: Calling it quits to having babies sort of feels like death to me. It’s probably odd to equate creating to dying, but ending the phase of reproduction is so definitive. In life, there are so few huge decisions that have now-or-never time constraint. I’d wager it’s why when you ask most moms, “are you going to have any more kids?,” you’ll likely get a flip-flopped dance filled with contradiction and confusion. I could go back college at 50 and study social psychology if I so wanted. Or we could pack up our belongings and move to Thailand when we’re 62. But we can’t turn back the years and have another baby. For me, it’s a matter of learning to sit with the anxiety. Let Go of Guilt: Call me Catholic, but there’s guilt. I felt terribly guilty for not wanting any more babies, because my God, I LOVE my babies. Something about not wanting more felt like an affront to the ones I have. It’s a deeply rooted feeling of why not more? I’m the oldest of three and my husband is tucked in the middle of four, so two feels like we’re calling it early. I secretly wondered: Does this make me selfish that I want to call it quits after two? Is there something wrong with me that I only want two? Or maybe it was the psychic that told me I had two boys waiting in the wings that kept me wondering. Could it be dogs instead of baby boys? Either way, I kept coming back to: Will I regret this? When I’m 90, will I look back on my life and wish I’d had a larger family? I’ll have more visitors in my nursing home, that’s for certain. I knew I needed free myself from my third-kid obsession and follow my heart. Be it another child or to sink into what we have. That’s when I used a friend’s technique of asking why and found my answer. Ask Why, Why, Why: On Easter, I went for a bike ride on the beach with my husband. We chatted, laughed, pedaled hard against the wind, and I mentally re-walked through our list. Why am I still thinking about about a third? Mon Dieu, is it that new baby smell, the blissful hours spent nursing, the garbed noises that turn into clear sentences … those tiny toes? No. Babies are beautiful, but I had savored those times with the girls and knew I was ready to leave all of that behind. I kept asking why until I reached my answer. I discovered that it’s not the now. It’s the big family notion for the future. That’s what gets me every time. It’s the could be instead of the what is. It’s the future that’s got a hold on me. After the bike ride, we went to my husband’s cousins’ house for Easter dinner. They are in their mid-50’s and have no children. Yet their home was bustling that Sunday. It’s a home filled with celebrations, warmness, and people. On Easter, it dawned on me. It’s the large, juicy life that I’m after. That’s not just our babies. A full house doesn’t have to be about children, our children. A full house is about people – friends, family, near and far. It’s the connections. As bittersweet as making the final call feels, I cannot imagine starting all over again. I’m wistful, but I’m done. Two and Through as it were. Have you made the “no more babies” decision? How did you make THE call? It’s so amazing to hear you sounding so assured and confident about something that can be so difficult to resolve. It certainly was for me. 🙂 Love the story about the childless couple with the beautifully warm home. It’s so true — family + community can come in so many shapes and sizes. And yours is beautiful just the way it is. I must admit, when you announced a third, I thought, how wonderful, should we do it too? I know we’ve talked about this together and the struggle with the back and forth and how to call it or not. I’m so happy and excited for you. A fantastic read! Excellent post! Love the point about a big family in the future. I always desperately wanted a sister. My mom brought home three brothers (and I cried each time 😉 I desperately wanted a daughter, and had two sons of my own. I have realized this is what God meant for me…I’m a tomboy through and through. I could never raise a girly girl. But that was never what I was after…I wanted the grown-up friendship; the bond that comes between an adult mother and daughter; to replicate the incredible closeness I share with my mother. Being the same age as you, I realized if I had a daughter now, I’d be 60 by the time she would be 20…not the grown-up relationship I was after. Like you, I always wanted two. As soon as I had my first, I knew I wanted 4. I never let that dream go, though now I’d be happy with 3. Not sure it’s in the cards for me (being recently divorced) but still hoping! Thanks for reading and sharing your heartfelt comments – I hope it works out for you to have another one. Walking through the whys, weighed with the pros and cons is what helped me. I feel at peace now and am no longer vacillating. I never really had to make this decision…..my OB basically told me, after my uterus almost ruptured with my last baby, that it wasn’t safe for me to be pregnant again. And with that, I knew the best thing for me to do, for my family and myself, was to have a tubal. I can’t say for sure if I was actually done, I have 6 kids, so I possibly would have been “done” after my last. But I used to say I wanted to be done having kids by my 30th birthday, and I was! I love this! So what I’m feeling. I also have two girls and we’re on the dawn of some independence. I just tell everyone I don’t want my youngest to be my ‘Jan Brady’. My girls are so close I don’t want to change that relationship. Love this. Thanks for the detailed decision making process. Its all about the juicy life!! May yours be super juicy too! lovely, very helpful thoughts. thank you! I’m so happy it helped!